Coral Cogs Smith is looking forward to beginning the newly created .5 position of “Outreach Ministry Worker” at Blackwood UCA. Blackwood is a suburb in the Adelaide Hills. It will be a change of pace after 10 years of congregational ministry in older congregations in the Western Suburbs of Adelaide. She will be working in a team ministry with the Rev Leanne Jenski (MoW). 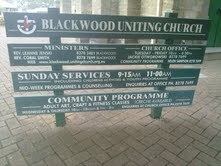 Blackwood is a larger congregation of about 275 regular attenders over two services (9.15 & 11.00). As well as a playgroup and other activities, they run an extensive community program of arts, crafts, yoga, men’s shed etc. Cogs will take up a role in the community programs, to build on existing programs as well as develop new initiatives. The existing community programs have an average attendance of 300 people and runs in school terms. A paid coordinator administrates these programs. - To support and encourage leaders, volunteers and participants of existing outreach programs. - To seek opportunities to enhance and build on existing programs. - To identify and develop new initiatives for community engagement. Cogs writes, “It is a great opportunity to do some deacon work! When I was going through college, I can remember the then principle shaking his head and saying, “what will you do when you leave college”.